The Emerald Ash Borer adult is 10-13mm long, or less than a half-inch. Photo by S. Ellis, USDA-APHIS. Last fall, an invasive menace to trees was found for the first time in the West: the emerald ash borer, in Boulder, Colo.
Green Ash has a compound leaf, with 5 to 7 leaflets. Photo courtesy of Wikipedia. If you own an ash tree in Cheyenne, the experts say hold off on taking action at this time, as there have been no reports of the beetle here. But keep an eye on it. Don’t let any unscrupulous people talk you into treating your tree with pesticides without confirmation from local experts who have been trained to diagnose emerald ash borer. Become informed. And be sure that your tree is a true ash, and not a mountain ash, which is not related or affected. The emerald ash borer is native to China, Korea, Japan, Mongolian, the Russian Far East and Taiwan. Michigan was the site of the first North America discovery in 2002. The original immigrants may have arrived unintentionally via wooden packing materials in shipments from Asia. Imported packing crates now have to be treated. The invasion soon spread to the other Great Lakes states and Canadian provinces and the states adjacent to those. 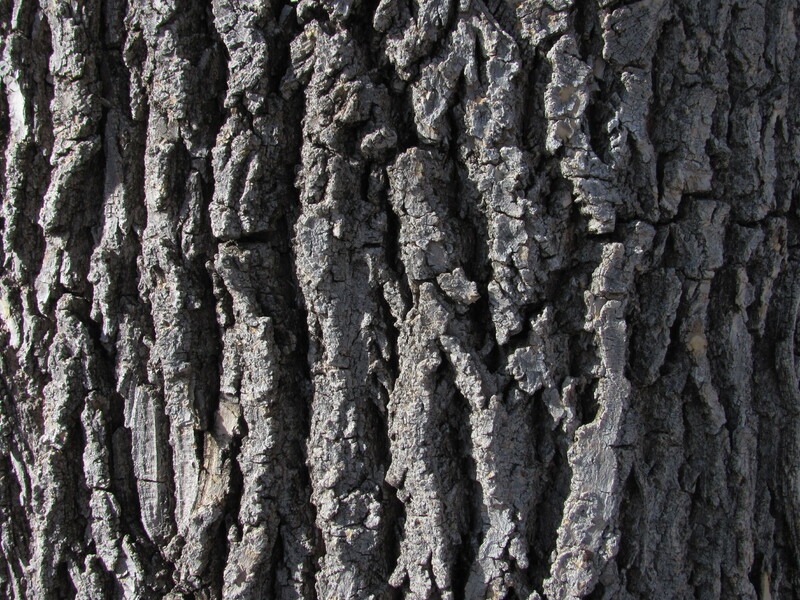 Mature Green Ash trees have deeply furrowed bark. Photo by Barb Gorges. There are 16 species of ash trees in the U. S., mostly in the eastern forests, and their loss is going to change ecosystems, maybe even extirpating two dozen species of butterflies. A U.S. Forest Service expert estimates that 50 million ash trees have already been lost. Millions of dollars have already been spent in eastern and midwestern cities removing dying trees. Ash has been popular as a street, park and yard tree across the country, as it is here, comprising 10 percent of Cheyenne’s trees, mostly green ash. 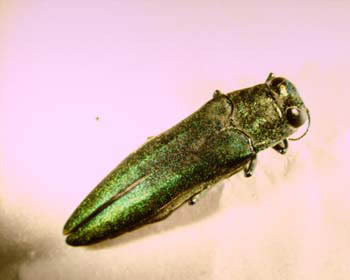 The emerald ash borer life cycle begins between mid-May and mid-August, when an adult lands on an ash tree and lays eggs. They aim for the upper parts of the tree so you may not catch a glimpse of the elegant, emerald carapace of the adult. After a couple weeks, the eggs hatch and the emerging larvae tunnel into the tree, finding the area just under the bark where the tree’s water and food delivery systems are coursing. If you peeled back the bark, you would see S-shaped galleries—tunnels chewed away by the larvae between August and October. If the tunnels under the bark girdle a tree limb, the flow of water and nutrients is disrupted and that limb dies. In two to four years, the whole tree dies. An Emerald Ash Borer D-shaped exit hole shows where the adult tunneled out, to fly off to lay eggs on another ash tree. Photo by Gerald Wheeler, from USDA-APHIS. During the winter, the larvae are dormant under the bark and then between May and June they emerge as adults, leaving 1/8-inch, D-shaped exit holes. Why D-shaped? The larvae are D-shaped in cross-section, flat on the back and round on the underside. Boulder is about a 90-mile drive from Cheyenne, but Boulder was 600 miles from the nearest emerald ash borer outbreak, in Kansas City, Mo. You would think with prevailing winds blowing in the opposite direction, this weak-flying insect, not finding continuous ash forest in between, would never make it to Colorado. So it’s clear that EAB arrived in Boulder with help—probably inadvertently, such as travelling in a load of firewood. Currently, Boulder is quarantined, so presumably infected wood will not be exported to Cheyenne. On the other hand, experts now think the Boulder invasion began at least four years ago, so there is a possibility that it is already here in Cheyenne and no one has recognized it yet. Keep in mind, there are several other insects which leave tree damage that could be mistaken for emerald ash borer. There is no vaccination for emerald ash borer. Do not apply pesticides to your ash tree without consulting our local experts (see adjacent box). Otherwise, you are wasting your money and needlessly killing beneficial insects and birds. Trees suffering the early stages of an emerald ash borer infection have been successfully treated with injections in their trunks or in the soil using particular systemic pesticides, a much better option than spraying. These pesticides travel throughout the tree, just under the bark where the emerald ash borer likes to feed. However, there are several reasons even these pesticides may not be a good option. 1—Injections are expensive, $250 per tree per year. And once the emerald ash borer is in your neighborhood, you’ll have to keep them up year after year. 2—Injections in the trunk mean punching holes. 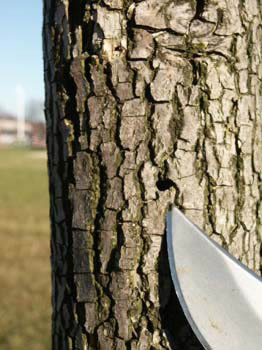 Any damage to bark increases a tree’s chances of becoming infected with other diseases, even if it survives emerald ash borer. 3—Ash trees with other health problems or growing in bad locations, such as under power lines, shouldn’t be considered candidates for preservation. 4—Scientists know that the active ingredients in these systemic pesticides, the neonicotinoids, are toxic to bees. Systemics injected into the ground under trees can travel to nearby flowering plants, making their pollen toxic, according to the Xerces Society for Invertebrate Conservation, http://www.xerces.org. The emerald ash borer is however, susceptible to cold. Rob Venette, a U.S. Forest Service research biologist interviewed in the Jan. 10 episode of National Public Radio’s “Science Friday,” reported that with only a few minutes at minus-20 degrees, 50 percent of the larvae overwintering may die. Firewood, and wood chips, from ash trees brought to Cheyenne could bring emerald ash borer. However, we should also consider what happens to trees cut down here. That would definitely be a help if there are any emerald ash borer s lurking in Cheyenne. Lisa Olson, director of Cheyenne’s Urban Forestry Division, told me the trees the city removes are checked for invasive insects before they are picked up by a firewood company that won the bid to do so. Infected wood is buried in the landfill. 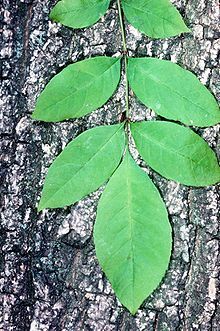 The best advice I’ve heard is to take the savings from not treating your ash tree and plant a replacement nearby now, instead of waiting for its demise—but don’t plant another ash tree as your future source of shade, not only because it could fall victim, but nursery stock could be infected, especially if it is from back east. There are alternative shade tree varieties recommended for Cheyenne by the Cheyenne Botanic Gardens. Stop by or visit online, www.botanic.org. Click on “Gardening” and then “Garden Tips” and find the “Trees, Shrubs and Wildflowers” PDF. Also check with the Cheyenne Urban Forestry Division and their website, www.cheyennetrees.com. Meanwhile, stay vigilant and check for 1/8-inch, capital D-shaped holes this spring. –Urban Forestry Division of the Cheyenne Parks and Recreation Department, 637-6428. –Catherine Wissner, University of Wyoming Extension Horticulturist, 633-4383. Categories: Emerald Ash Borer | Tags: Cheyenne Botanic Gardens, Cheyenne Urban Forestry Division, Emerald Ash Borer, Laramie COunty Conservation District, University of Wyoming Extension | Permalink.